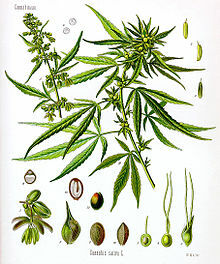 Cannabis (/ˈkænəbɪs/) is a flouerin plant that includes three species (an seiven taxa) or sub-species, sativa, indica, an ruderalis. The plant is indigenous tae Central Asie an the Indian Subcontinent. This page wis last eeditit on 8 November 2015, at 22:47.